Exchanging ideas, sharing know-how and exploring ways of working together are in the core of the Darmstadt Summer Course activities. In many projects of the 2018 Darmstadt, non-hierarchical knowledge transfer, process-oriented, interdisciplinary or collective work were in focus. Two of them are featured in this film by Katharina Herkommer and Jörg Lohner: In her workshop „Collective Composing“, composer and oboe player Cathy Milliken brought together instrumentalists and composers in order to develop a piece of music collectively. 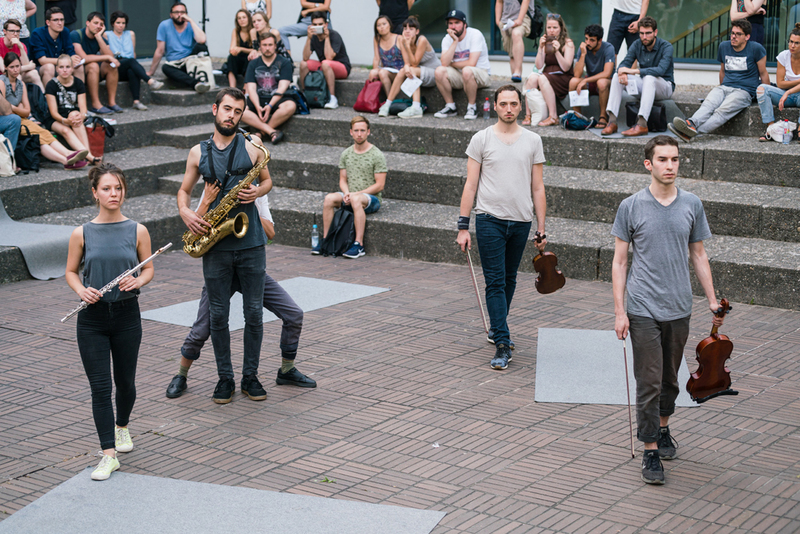 The „Dance & Music“ workshop by choreographer Daniel Linehan and composer Stefan Prins was about designing projects in interdisciplinary groups of dancers, musicians and composers. The works-in-progress were presented in Darmstadt in July 2018.